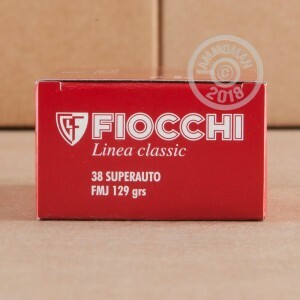 This .38 Super ammunition from Fiocchi is a great choice for training with your 1911 or other .38 Super pistol. 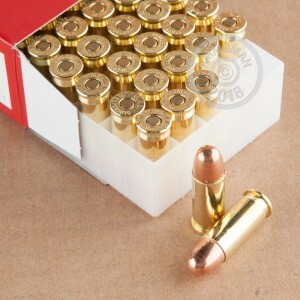 Each cartridge in this box of 50 fires a 129 grain full metal jacket bullet at a muzzle velocity of 1,150 feet per second. This is a relatively light-kicking target load that will be very comfortable to shoot in a full size steel-framed gun like the 1911. 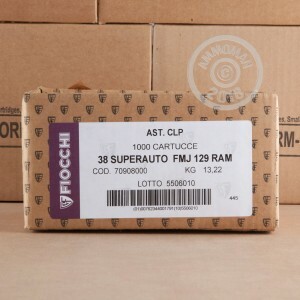 Fiocchi produces one of the best and most affordable .38 Super loads on the market. Most of their centerfire production takes place at Fiocchi of America in Ozark, Missouri with the remainder being imported from Lecco, Italy. Save on quality ammunition at AmmoMan.com, where all orders over $99 ship for free!